Everyone knows what a Myst Universe junkie I am. I often joke with my friends that one day I want to go on a “pilgrimage to Mecca”, meaning that I dream of one day visiting Cyan Worlds HQ up in Spokane, Washington. One of my friends has painted a picture of the building, another has photographed it and many others have visited it. Put simply, when something impacts your life in a very substantial way, you really want to visit where it came from, you want to thank the people who created it in person. But one day, I’ll get there and, oh man, am I going to write about it! But for now, let’s talk Obduction. On Christmas Day, I got Obduction to follow in the tradition of getting Uru: Ages Beyond Myst on Christmas Day 2003 which is how I eventually met my pal Janet. Now let’s get something straight right off the bat, Obduction is NOT a part of the Myst Universe. Succinctly, it is billed as the “spiritual successor” to Myst. As someone who is an “avid” and die-hard Cyan fan, I will tell you that while Obduction might not be set in the Myst Universe, it still retains all of the hallmarks of Myst with Rand and Robyn’s hand prints *all* over it. The “standards” that are a part of any Myst game are in it. It is really hard for me not to consider it a part of the Myst Universe, it just has different characters and different tech, that’s really it. I mean, if The Great Tree of Possibilities was really doing its thing, this is what I would totally expect to happen! You can’t hop galaxies and expect the people and tech to stay the same! Linking Book, Seed Swapper…same difference; It’s still the same travel technology, just in a different package. Besides, the story can’t revolve around Atrus forever, that poor bugger needs a break, so I am down with digging into some new Ages, worlds, characters or whatever they want to call it. There’s room for everyone with Terokh Jeruth on the job. You’re welcome. Glad I found that post on https://t.co/9exueoMihu searching for Pehpsee info (@hallstigerts helped). 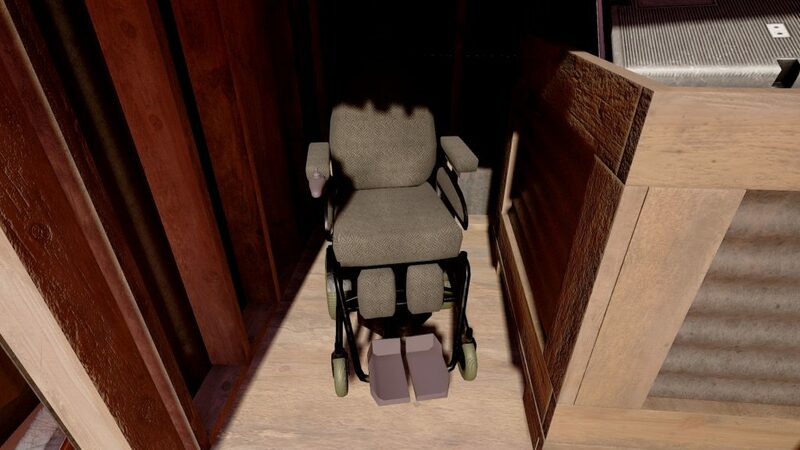 Janet’s wheelchair is in Obduction. So, with patience in tow, and with the attitude of “obstacles be damned,” I was set on seeing my friend, if only in spirit. And my patience paid off. Two hours and several solutions later I was standing in front of it, crying my eyes out and wishing that my dear friend was here to see the positive impact she has made on so many lives. I miss Janet every single day. I miss how she could navigate obstacles like a superhero, bounding over them like they were nothing. I think she would have loved the laser buggy and probably me and about 50 other people would be trying to figure out how to install a blue laser beam on the front of her chair by now. But selfishly, I wish she were here to help me process and accept being diagnosed with arthritis myself. But in all of the puzzles and visuals and the magnificence of Obduction, I can guarantee you one thing, besides adoring the game, Janet would have made sure to have the player shadow on just so she could see herself run. As far as the rest of the game goes? It’s all kinds of yummy Cyan goodness. The kind that avids like me roll around in like a cat in catnip. Like its predecessors, Obduction has the legendary faceplant-and-headbang-on-the-the-desk difficulty we’ve all come to know and love. It also has little hints and homages to almost every single age in the Myst Franchise. Die hards like me are probably most like D’ni Tourists, linked in directly from Cavern, pointing at all of the little reminders, from windmills, to cones, to all sorts of things that as citizens of D’ni we just know and recognize on sight. Heck, for me? When Robyn Miller popped up as C.W., I was a kid at a rock concert screaming with my arms in the air, whooping and hollering like I had lost my mind. Thank you’s go out to Justin Esparza, Lauren Hall-Stigerts, Ryan Warzecha, and the whole crew at Cyan for creating Obduction. Of course, ultimate thanks go to Rand and Robyn Miller for creating the Myst Universe so that I could meet Janet in Uru. Thanks for starting out in your garage in 1994 and eventually giving me one more adventure with my pal. If you have not played Obduction yet, go get it. Get Obducted. Go find Janet’s chair. Run. Jump. Climb. And don’t you ever dare take your legs for granted. Give to the Arthritis Foundation in Janet’s name so, even though she’s in Heaven, we can help people like her rise and run. Most of all, be like Janet. Greet everyone you meet with a smile on your face and love in your heart.